Advocacy is the primary service offered by the office. OVS may take action on behalf of Veterans, their families, and survivors to secure appropriate rights, benefits, & services. This includes receiving, investigating, and resolving disputes or complaints of any nature. Burials for qualified veterans (including U.S. war allies) and their dependents can be buried in the Hawaii State Veterans’ Cemetery on Oahu or Veterans’ cemeteries on Hawaii, Kauai, Maui, Molokai or Lanai. 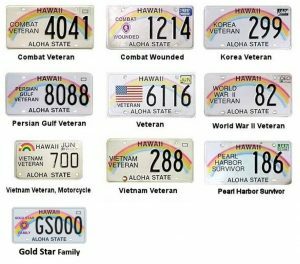 For the same cost as a regular license plate Veterans can choose, if qualified, a Veteran, Combat or Combat Wounded, Pearl Harbor Survivor, Former POW, World War II Veteran, Korea Veteran, Vietnam Veteran, Persian Gulf Veteran, or Gold Star Family license plate. These plates are also available for motorcycles. 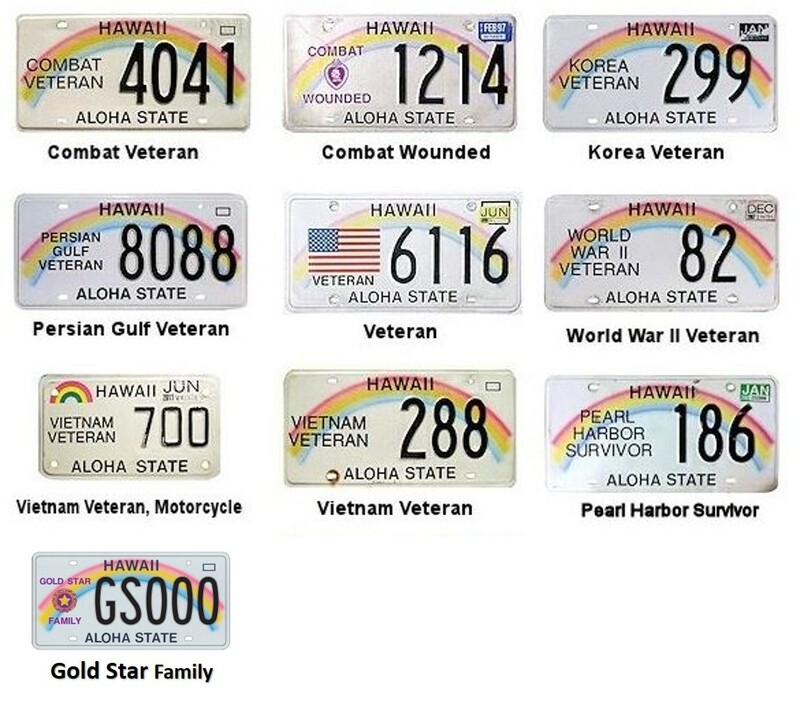 The below shows some of the license plate examples that are available. Payment by the State of up to $5,000 to each qualified totally disabled Veteran for the purpose of purchasing or remodeling a home to improve handicapped accessibility. Award of payment pending the availability of State funds and Veteran Affairs approval. Contact your local OVS office for more information. Tax exemptions on real property owned and occupied as a home by a totally disabled Veteran or their widow(er). Tax exemptions on passenger cars when they are owned by totally disabled Veterans and subsidized by the Dept. of Veterans Affairs. This benefit varies by island. Visit your local real property tax office for more information. Free certified copies of vital statistics forms when needed for Veterans’ claims.